According to Statistics Finland, the turnover of construction enterprises grew by 7.8 per cent in the third quarter of 2017. In the corresponding period one year earlier, the growth amounted to 8.4 per cent. The sales volume of construction grew by 4.2 per cent in July to September. Among construction industries, the growth was still strongest in building construction, where 13.2 per cent more turnover was accumulated than one year earlier. 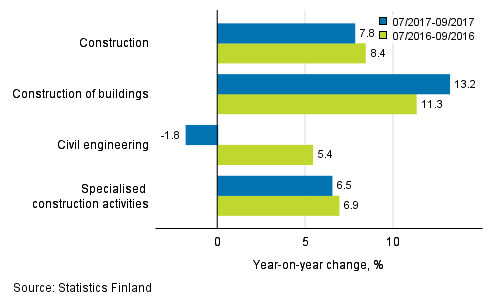 The turnover of specialised construction activities went up by 6.5 per cent. In turn, the turnover of civil engineering fell by 1.8 per cent. The sales volume of construction enterprises grew in the third quarter in building construction by 9.4 per cent and in specialised construction activities by 3.0 per cent. The sales volume of civil engineering went down by 3.6 per cent. Index of turnover of construction will adopt base year 2015=100 from the January 2018 data. Data using the new base year will be published for the first time in April 2018. ISSN=1798-5935. September 2017. Helsinki: Statistics Finland [referred: 19.4.2019].